Engineer Anghel was born in the village of Şerbăneşti, village included today in the commune of Lieşti, inside the county of Galaţi. He was university professor, member Of the Romanian Academy and in the end even president of it. He designed (in 1888) and led then the building of the bridge over Danube at Cernavodă, between 1890 (the foundation stone was placed on October 9th -old style- / October 21st -new style) and 1895 (inauguration took place on September 19th / October 1st). At the time this bridge was longest in Europe, third longest in the world, stretching over a total distance of 4088 meters. Until after the Second World War, the bridge was considered the most important and most magnificent engineering piece of work in this country. The bridge along auxiliary works cost 35 million lei gold. 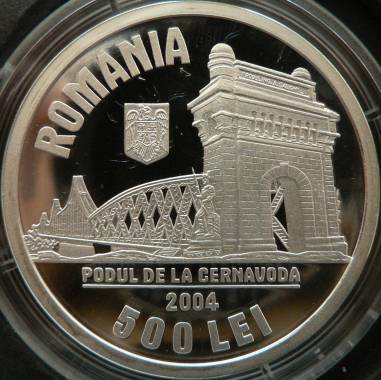 Today, the Cernavodă Bridge is called Engineer Anghel Saligny Bridge (inscription PODUL ING. A. SALIGNY being barely visible on the coin), although at the time it was build its name was King Charles Bridge (Podul Regele Carol), after the sovereign's name. Queen Marie of Romania has written in her memoirs (Story of My Life) about the participation of Romania in the Balkan Wars: "Romania thought that it had a historical right concerning the region in Bulgaria between Rusçuk [today Ruse] and Varna and, if it would have entered the fighting as an ally, it should have raised its voice, or if it could not reach its grand claims it would have at least seized the line Silistra - Balchik, so much needed in order to defend its great bridge of Cernavodă." The passage cited was translated into English from Romanian, as we were not able to grasp in our hands the original English text written by Queen Marie. Anghel Saligny led the modernization works of the Constanţa harbour, started in 1899 and finished only after more than 10 years. Between 1888 and 1889 he designed and supervized the construction of the silos at Brăila and Galaţi, employing as world premier in massive structures prefabricated wall panels and reinforced concrete. 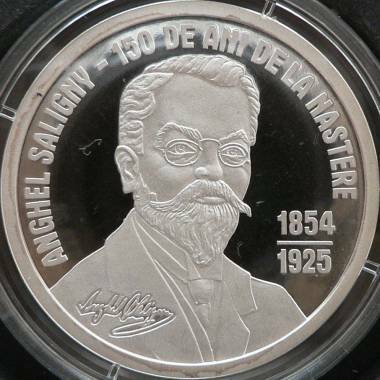 The coin was engraved by Vasile Gabor.